We've got a theme and an address to send layouts to for our great gallery opening on January 5th! Good News: Scrapbooking is going to be appreciated as high art for expressions sake in a gallery of art fiend onlookers who probably know nothing about scrapbooking. I had a two year apprentiship under an artist and worked at a guild in the mediums of charcoals, watercolors, pastels and wood carving. I wasn't so good but I can talk the talk and I will go toe to toe with anyone who thinks the scrapbook arts are reserved for the basements of middle America. It's got expression, passion, composition, emotion and creativity. Layout: 12 x 12, 1x1, whatever you want. It's your art baby! It just has to be a scrapbook page. Deadline: Must be recieved by Tuesday Jan 2nd. Reward: Telling your friends who are "published" that you were actually in a gallery show. Many of you will have pictures of your layouts on the Scrapped website and blog. Please give us a name and location to display adjacent to your work. Layouts won't be returned, they will be kept and accumulated into albums for more mobile showings to new scrapbookers and to challenege current scrappers to take pride in their work. So this means that I will have to shovel off my scrapbook table that's crammed into the corner of a spare bedroom and get work. You know all those magazine layouts and DVD's that are floating around to magazine subscribers that show celebrity scrapbook rooms with custom cabinets, desks and daylight color lighting? Well get a juicy look at this celebrities scrap room. Nice huh?! To be fair, I've been traveling a little and collecting new scrap gizmos everywhere I go. 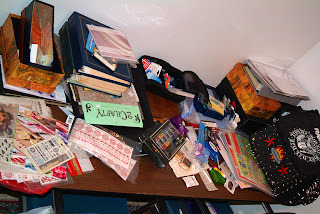 If I'm only home for 1-2 days I just pile it up on the table and need to stop collecting and start cutting and sticking. Here's a digital layout I did to prime your pump! Feel free to do whatever you'd like with the theme. It can be about art you've collected on your walls like Norman Rockwell - velvet Elvis - Precious Moments figurines. It can be about baking cakes ( something I like to do ), feng sheui, tattoos, your pimped out minivan or the beautiful babies you've made. The sky's the limit. Oh so many layout choices and so little time! Must get scrapping. ok, i read all that about submitting layouts and everything, but like a blonde with ADHD, my question is: how can i find the dvd with celebrity scrap studios? I love to snoop in people's scrap rooms and don't want to miss anything. nothing against your table, wes. you have a nice table too. oh, i forgot to sign in on that above post. i don't read anonymous rantings so don't want to leave one. Rebecca gets these DVD's with her subscription to Creating Keepsakes or some magazine like that. If you like them you have to pay in the neighborhood of $27 to keep them, otherwise you send them back and avoid the charge. Crazy. I'll check on th details. I've seen one with Ali Edwards and although she is an interesting person the production value was pretty corporate / industrial so it was pretty dry. I couldn't sit through the whole thing. Man, I need to find a gig where I can shoot vanilla stuff and charge $27 a piece for DVD's! I wonder how many of those doozies they actually get the money for??? As far as vanilla, just ask your groupies to tell you what they want to see and you'll get the ideas. As for me, i want to see EVERYONE'S scrap studios (the celebrities, AND the nonames) - but make it chocolate with carmel drizzled all over with a cherry on top - and I want to see them creating a page or two. I want to see them choose color and composition. I want to see them create with the normal interuptions (are there 2 r's in that word? ), kids hollering for lunch, phones ringing. i really am a snoop. but so is most everyone else. Time for "Scrapped Part Deux". or a Scrapped Reality Movie. Now how much money would that take? A guy from LA saw Scrapped in Milan and we've ended up being buds. He's been telling his friends about it and one of them does pilots for shows ( among other things. ) I pitched a show to her and she's pitching it to some connections right now. I don't know what ( if anything ) will come of it but but she's worked on some other projects I can't mention that took off really well. My concept was to not just show HOW to scrapbook but really focus on the people and the stories. Take different styles and look into who's expanding digi-scrapping, artistic, chunky, heritage, archival, etc. Take a look at what scrapbooking looks like in different cultures because yo get to see how other people live, work, eat and whats important to them. The clincher would be if we can get into people's homes - people that don't scrapbook but you might know from their celebrity status, musicians, actors, sports figures, nascar drivers, etc. and have me teach them how to scrapbook. Then you can see thier lifestyle, their homes, all that stuff. It would be a gas. Plus, I could just be a noodle head like I already am and ask inappropriate questions, etc. whew! that horse is galloping! i want to go to CHA. don't qualify on any level. MS, huh? she saw all those dollars flying right past her into holtz, swapp, and the other bazillion companies. would love to see donna, ali, heidi, kristina, cathy and yay, (nay, ESPECIALLY) thou, demonstrating on ms. and a few dozen more artists that i don't even know about. even better, get booked on the view. rosie loves crafts. that would be a HOOOt. what rosie wants, rosie can make happen. I'm IN Wes - I have just the LO for you, one of my first digi pages that resides on the cover of my digi album. I'll probably just drop it off at your house because I still have some of your DVDs that we were looking at before I did the premiere cover art.